<a href="http://www.arupassociates.com/AAH_News.asp" target="_blank">Arup Associates</a>’ stadium for the 2022 <a href="https://inhabitat.com/brasilia-remodeled-national-stadium-will-be-a-solar-showcase-for-the-2014-world-cup/" target="_blank">FIFA World Cup</a> Qatar Showcase has been nominated for World Architecture News’ 2012 Engineering Award. 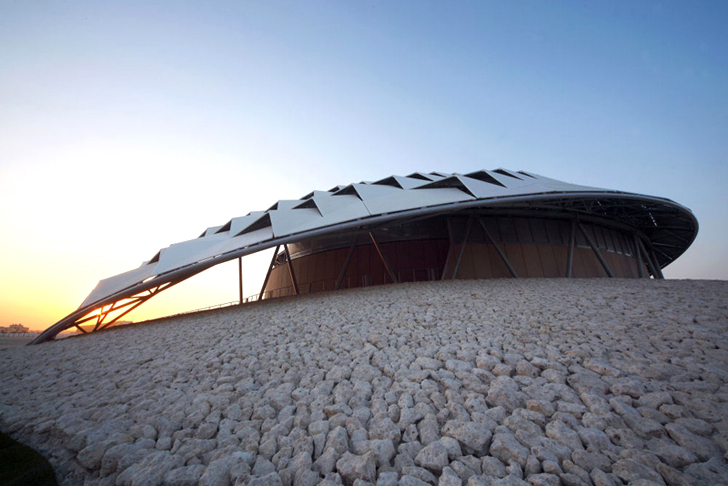 The gorgeous zero-carbon structure is the <a href="https://inhabitat.com/arup-unveils-stunning-solar-powered-arena-for-2022-world-cup-in-qatar/" target="_blank">world’s most sustainable stadium</a>, setting a precedent for both the sporting and architecture fields. 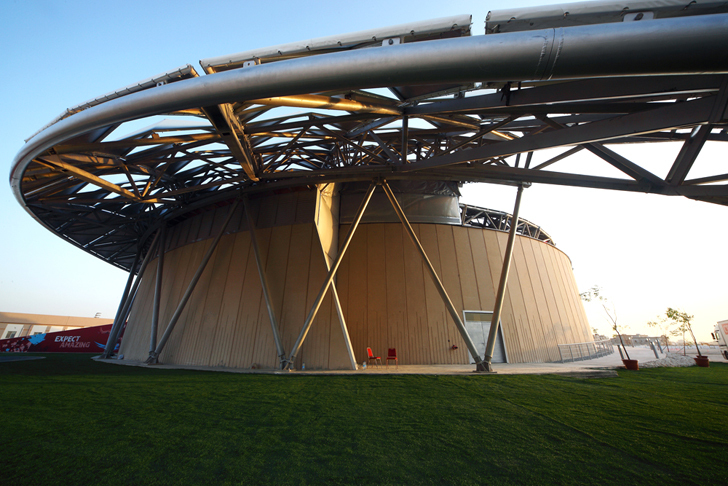 The space ship-shaped stadium runs on solar power while protecting spectators from the strong summer heat. 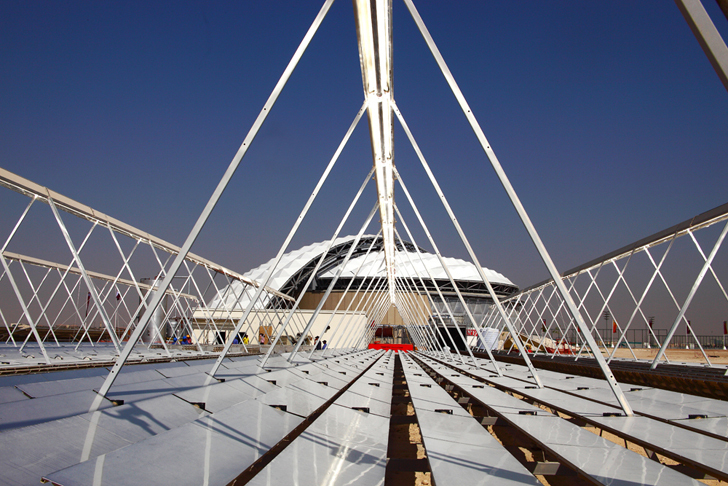 The state of the art cooling and climate control technologies in Arup’s design is meant to set the bar for technology across the <a href="https://inhabitat.com/scientists-in-qatar-develop-solar-powered-clouds-to-cool-world-cup-stadium/" target="_blank">arid climate of Qatar</a>, and regions like it. The design was paramount in the decision to adopt the Arup Associates’ design, for not only its architectural design, but also the message that building a sustainable and <a href="https://inhabitat.com/vinyl-from-london-olympics-will-be-recycled-for-the-2014-world-cup/" target="_blank">zero-carbon stadium</a> sends to the world concerning renewable energy, especially in the Middle East. 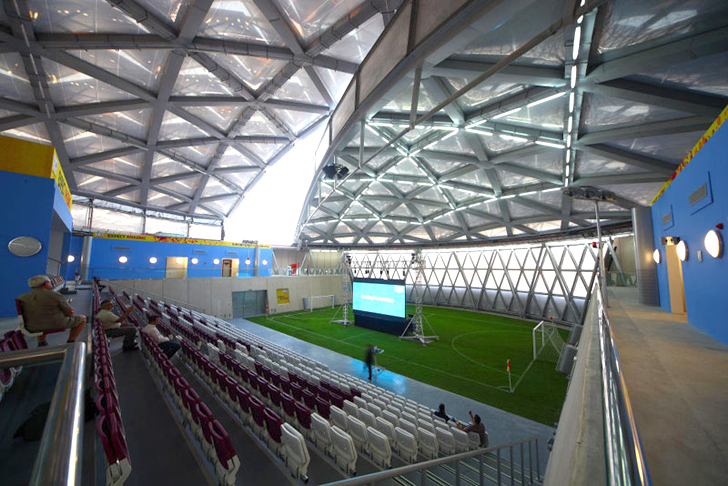 The <a href="https://inhabitat.com/future-football-stadium-in-addis-ababa-celebrates-ethiopia’s-ancient-heritage/" target="_blank">saucer-sized stadium</a>, called The Showcase, has a retractable roof, giving the option for open air games when the scorching sun goes down, and also angles to cast a giant shadow to keep fans cool during the day. 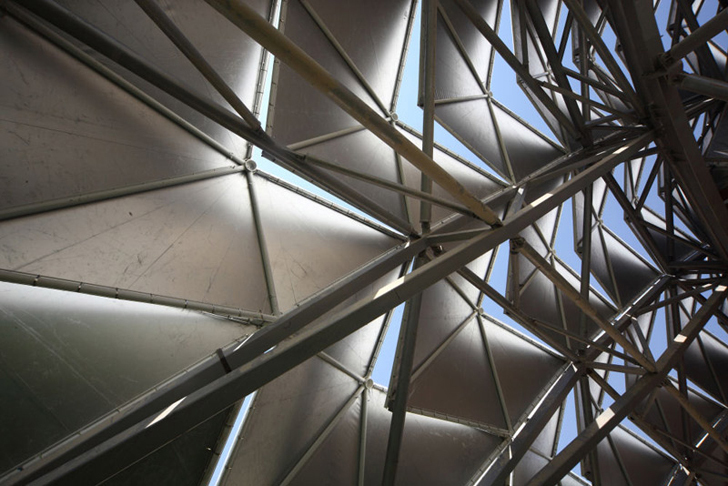 The roof is made up of hundreds of panels that can be adjusted to field strong winds or the sun from players and guests. Fans will stay cool by cross breezes as well as under-seat cooling, rather than blasting air conditioning throughout the <a href="https://inhabitat.com/chelsea-football-club-bid-to-turn-iconic-battersea-power-station-into-a-stadium/" target="_blank">stadium complex</a>. <a href="https://inhabitat.com/iea-predicts-40-percent-world-wide-increase-of-renewable-energy-usage-by-2017/" target="_blank">Photovoltaic solar panels</a> siphon the sun’s energy, and store it on site when the arena isn’t being used. Biofuel supplements the energy usage when the stadium is in use and requires extra energy. The Showcase’s ability to be <a href="https://inhabitat.com/the-stillwater-energy-plant-in-nevada-is-the-worlds-first-solar-geothermal-hybrid-plant/" target="_blank">carbon-zero in a desert climate</a> is not only incredible, but entirely worthy of WAN’s award. 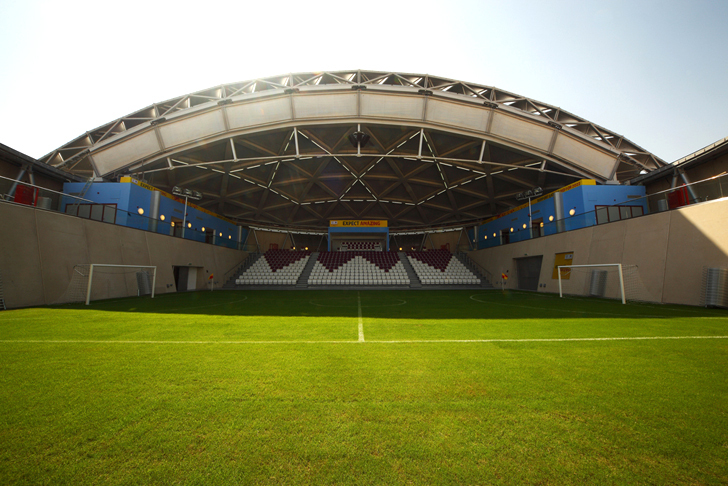 Arup Associates’ stadium for the 2022 FIFA World Cup Qatar Showcase has been nominated for World Architecture News’ 2012 Engineering Award. The gorgeous zero-carbon structure is the world’s most sustainable stadium, setting a precedent for both the sporting and architecture fields. 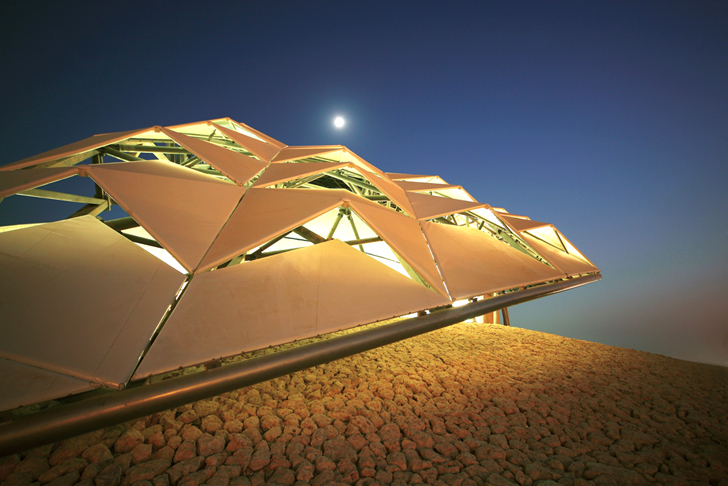 The space ship-shaped stadium runs on solar power while protecting spectators from the strong summer heat.